With the country's largest inventory of light gauge stainless steel, Brown Metals can fill your order to your exact specifications in a week or less. From just a few pounds to thousands of pounds, we can get you the material you need right on time and just the way you need it. Let Brown Metals take care of your stainless steel needs with our incredible selection of light gauge stainless steel. Sometimes, coil just doesn't cut it and you need sheet. At Brown Metals, we do everything to YOUR desired needs. 24" x 120"? Only if that's what you really want. Do you really need 5" x 14.280"? Sure, we can do that or any other dimensions you prefer. Don't settle for "standard sheet" when you really need custom sheet. And by the way, we make it more cost effective by doing it your way! Custom sizes also need custom packaging. 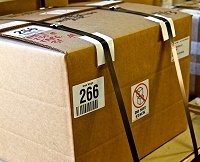 We package our products to your specifications to ensure safe delivery to your facility. Custom box or skid sizes are standard at Brown Metals. We package the way you want at no extra cost. This is just a way we contribute to a lower overall cost in your production. At Brown Metals, we bring most of our inventory in at 36" wide. Some light gauges are only available at 24". Please inquire with us regarding your precise needs. Brown Metals provides wide coil for your most difficult applications. Whether you are in the stencil industry,making bellows or just have an application that needs wide, flat stock, Brown Metals can supply exactly what you need. Don't settle for "commercial quality" when Brown Metals can deliver the best quality in the country at the most competitive price. You need it how narrow? You need an extremely tight tolerance? Why have you not contacted us sooner? Brown Metals is the industry leader in light gauge slit coil. No company has more experienced slitter operators than Brown Metals. Extreme tight tolerances are our specialty. Do you need +/- 001” on your width? Well, it’s more than likely we can meet your needs. Give us a call or send us an email with your next inquiry. Brown Metals Company: Custom Quality You Can Depend On! Brown Metals Company specializes in supplying custom-slit thin gauge stainless steel alloys in coil and sheet form. Our inventory includes 300 series (301, 302, 304, 304 Stress Relief Annealed (SRA), 304L, 305, 316, 316L, 321, Tool Wrap) stainless steel, 17-7, C17200 Beryllium Copper, C1008 / C1010 Steel, and Boxed Shim Stock. 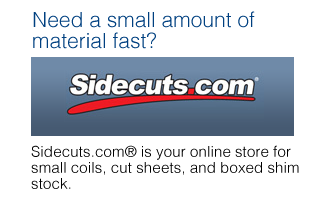 We offer thicknesses from .001" to .035" thick with slitting capabilities of widths as narrow as .020" up through 36".